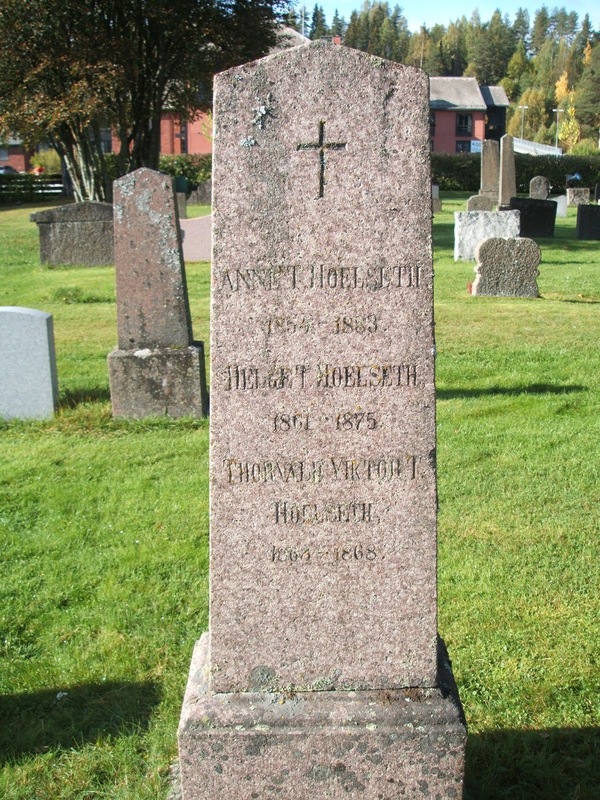 My Hoelseth family has its name from the farm Holset in Åmot in Østerdalen, Hedmark fylke (county). All the Hoelseths living today, both the agnatic and the cognatic lines, descend from my great-great-great-grandfather Tollef Olsen Hoelseth (1825–1876). 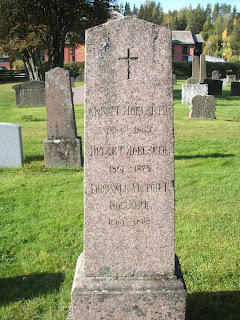 Buried together with him are his first wife, Valborg Gudmundsdatter, née Waal (Vål) (1823–1873) and three of his eight children from his first marriage – Anne Tollefsdatter Hoelseth (1854–1883), Helge Tollefsen Hoelseth (1861–1875) and Thorvald Victor Tollefsen Hoelseth (1863–1868). The photos were taken on the last Saturday of September 2015 when my family and I made a short stop on our way up Østerdalen to Trondheim. I have visited the cemetery several times over the years, but this was my first visit after I bought my present digital camera in 2004. Genealogically speaking there are many interesting graves on the cemetery, so I hope to return some time later to take more photos. The current church building was set up in 1901 and consecrated the year after. Older photos of the church can be found on Wikipedia. According to a brochure which I received on a previous visit, the old church from 1768, situated at the same place, was demolished in 1899 to make room for a bigger one. Two even older churches were situated on a hill south of the pastoral farm in Åmot. There are several churches in Norway named Åmot kirke (church), by the way. The church mentioned here is situated at Rena in Åmot municipality. 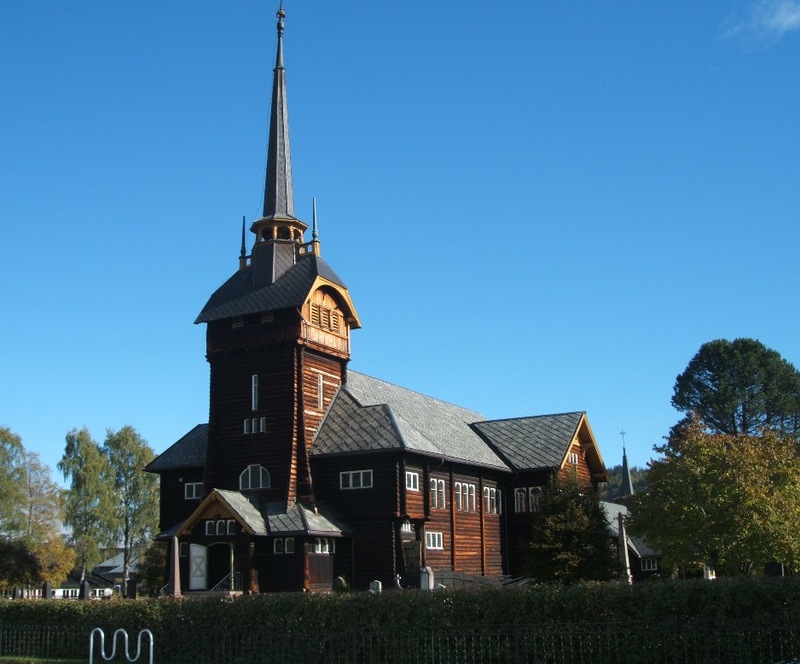 The others Åmot churches are in Nordre Land and Modum. 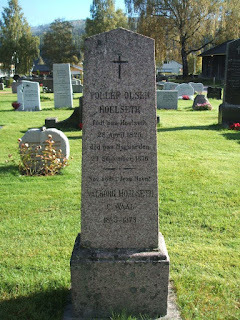 For more details about my Hoelseth family, see my website. The last issue of Royalty Digest Quarterly arrived in my mailbox sometime this week while I was on vacation. I haven't read much of it yet, so this will be a short presentation rather than a review. The front cover shows a photo of Queen Marie of Yugoslavia with her sons Tomislav, Andrej (Andrew) and Petar (Peter). The photo is obviously printed because the magazine's historical consultant, Charlotte Zeepvat, this time has chosen Yugoslavia/Serbia as the topic for the traditional photo album. Her article is titled The Royal House of Serbia and Yugoslavia. 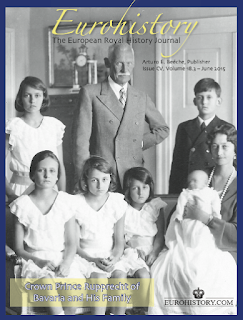 Two Family Albums, because the article covers both the Obrenovic and the Karadjordjevic dynasties. Besides a four pages long introduction, the article contains 92 illustrations as well as three pages with genealogial tables. The article starts on page 24 and ends on page 55. I have a soft spot for the Eastern European dynasties and I am therefore very pleased about the topic. The editor and publisher, Ted Rosvall, uses his Editor's Corner to comment on the recent events in Romania, where the former King Michael in August removed the titles and succession rights from his grandson, Nicholas Medforth-Mills. I am not the only person who has questioned the king's decision to set up a new law of succession for his family. I will not comment further on that discussion here, but just want to express how sorry I am for all the mess and negative headlines the king, who earlier was loyal to the principles of a constitutional monarchy, has created in recent years. Well, Romania is a republic now, and the chances of restoration is close to zero, so it is only an academic discussion anyway. 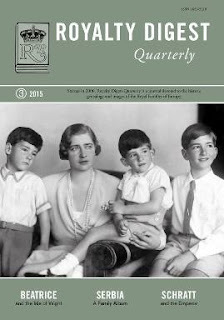 Michael L. Nash has made many contributions to RDQ over the years, and this time he has written the article The Jewels of Portugal. Another well-known royal history author is Coryne Hall, and she has contributed with the article Princess Beatrice, the Isle of Wight's true friend. Charlotte Zeepvat's second article of the present issue is titled The Terracotta Angel, which deals with sculptural presentations of various royals, a neglected form of portraiture according to the author. Then follows her second article, the photo album on the Obrenovic and Karadjordjevic dynasties, which has already been mentioned above. I am not familiar with the name Stefan Haderer, but he seems to come from Austria, and his contribution is titled A highly unusual affair. The topic is the intimate relationship between Emperor Franz Joseph I of Austria and actress Katharina Schratt. Finally, the column The World Wide Web of Royalty gives a sample of royal news since the last issue was printed. This time we can read news about the Imperial, royal or princely houses of Altenburg, Austria, Bagration, Hohenlohe-Langenburg, Lippe, Oldenburg, Saxe-Coburg and Gotha, Saxe-Weimar-Eisenach, Solms-Hohensolms-Lich and Solms-Wildenfels. Oh I so much loves the names of the German dynasties! I have in other words a great reading time waiting for me next week. The only column I miss is the book reviews, as I also commented on last time.